(CBS/AP) KABUL, Afghanistan - Warning he's at the "end of the rope" over civilian casualties, Afghanistan's president angrily accused the U.S. on Friday of not sharing information about how an American soldier allegedly shot and killed 16 Afghans in two villages. The incident has reverberated through the already complicated relations between the U.S. and Afghanistan, endangering talks over a long-term relationship after most U.S. and NATO combat troops withdraw by the end of 2014. In an emotional meeting with relatives of the shooting victims, Karzai said the villagers' accounts of the massacre were widely different from the scenario depicted by U.S. military officials. The relatives and villagers insisted that it was impossible for one gunmen to kill nine children, four men and three women in three houses of two villages near a U.S. combat outpost in southern Afghanistan. "In his family, in four rooms people were killed  children and women were killed  and then they were all brought together in one room and then set on fire. That, one man cannot do." Karzai said the delegation he sent to Kandahar province to investigate the shootings did not receive the expected cooperation from the United States. Officials within the Afghan government told CBS News that the Afghan army chief of staff, Gen. Sher Mohammad Karimi, who accompanied Karzai to the meeting, said he was denied access to the suspect because American officials identified him as a special-forces soldier. Then he was told that the soldier demanded a lawyer and could not speak to Afghan officials without representation. He said many questions remained about what occurred, and he would be raising the questions with the U.S. military "very loudly." 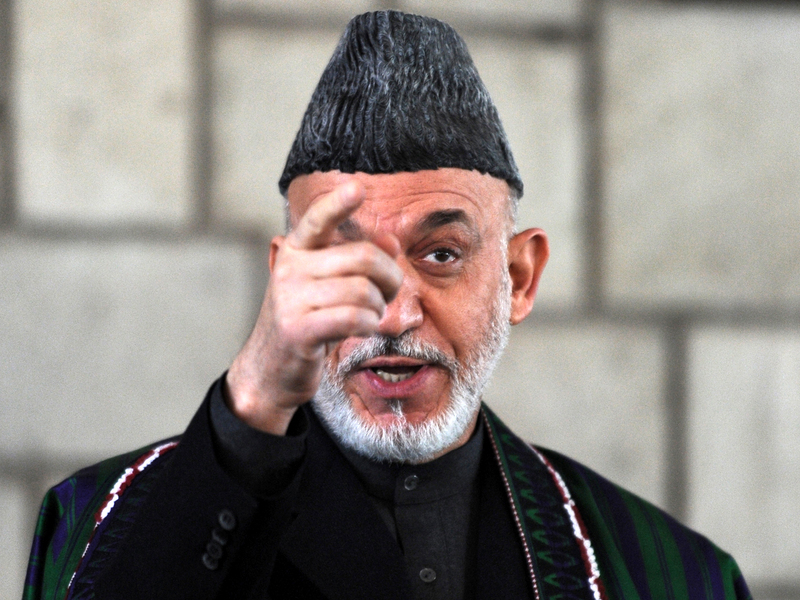 The U.S. military had no comment on Karzai's remarks. The Afghan leader stressed that he wants a good relationship with the international community, but that it was becoming increasingly difficult in light of airstrikes that miss their targets, leaving civilians dead and raising opposition to night operations where troops raid homes looking for insurgents. "This has been going on for too long," he said at the presidential palace. "You have heard me before. It is by all means the end of the rope here. ... This form of activity, this behavior cannot be tolerated. It is past, past, past the time." NATO has said that night operations have been instrumental in rounding up midlevel commanders and Taliban bomb makers. The coalition says more than 90 percent of night operations are done alongside Afghan forces and that more than 85 percent are conducted without any shots fired. The United Nations has reported that last year was the deadliest on record for civilians in the Afghan war, with 3,021 killed as insurgents ratcheted up violence with suicide attacks and roadside bombs. On Thursday, Karzai demanded that international forces pull out of rural areas because the fight was not in the villages. Afghan officials said Karzai made his request to immediately pull back from the villages during a meeting on Thursday with U.S. Defense Secretary Leon Panetta. U.S. officials said, however, that he did not tell Panetta that it should happen immediately. Karzai said his demand for a withdrawal from villages was a topic of a phone call he received Friday morning from President Barack Obama. Karzai's office and the White House issued statements recounting the phone call. Both said the two leaders discussed Karzai's longstanding concerns about night raids and house searches and they agreed to finish negotiations on a memorandum of understanding to resolve the issues. They agreed to further discuss Karzai's concern about the presence of foreign troops in Afghan villages, both statements said. On an unrelated matter, Obama congratulated Karzai and his wife on the birth of their daughter. Karzai also has a 5-year-old son, Mirwais. The suspect, a 39-year-old Army sergeant who remains unidentified, is expected to be brought to the military prison at Fort Leavenworth in Kansas. Officials say that transfer was necessary because there was no appropriate detention facility to hold him in Afghanistan. Dealing another blow to the war effort, the Taliban on Thursday said they were calling off the talks, charging that the U.S. had failed to follow through on its promises and made new demands. The militant group also said the U.S. falsely claimed that it had entered into multilateral negotiations that included the Afghan government. Karzai said Friday that the Taliban should be talking directly with his government. The moves represent new setbacks to America's strategy for ending the 10-year-old war at a time when support at home for the conflict is plummeting. Part of the U.S. exit strategy is to transfer authority gradually to Afghan forces. Another tack is to pull the Taliban into political discussions with the Afghan government, though it's unclear whether there has been any progress since January.